Playing Fatal Fury 2 on a Super Game Boy has its advantages. *Like Fatal Fury games? Check out my review of Fatal Fury: First Contact as well! Note: This game was played on a Super Game Boy that was inserted into a Super Nintendo Entertainment System. The SNES was connected to a 32-inch HD tv with S-video cables. Quick History: Nettou Garou Densetsu 2 (translated: Dead Heat Fighters Legend of the Hungry Wolf 2), better known as Fatal Fury 2, was released for the Game Boy handheld system exclusively in Japan in 1994. Fatal Fury 2 was originally released for the Neo Geo MVS (arcade) and AES (home console), as well as being ported to numerous other home consoles. 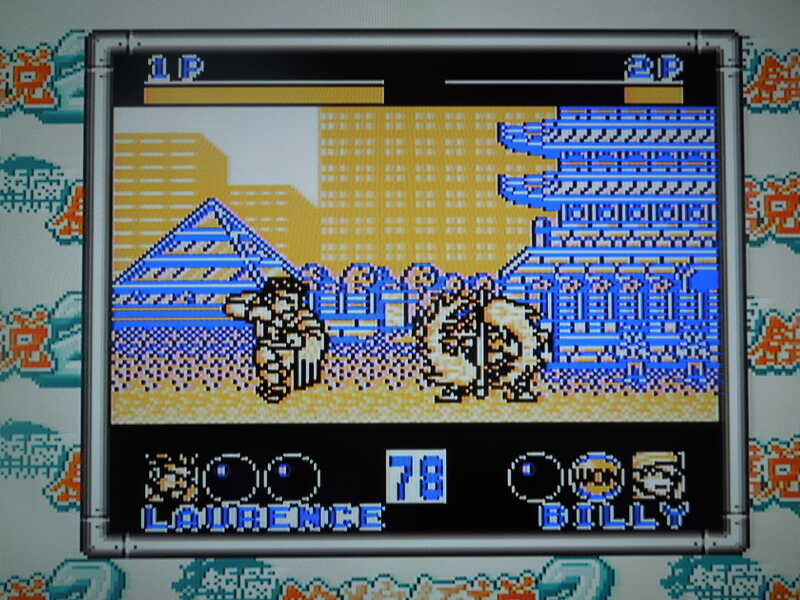 Fatal Fury 2 for the Game Boy used a ‘super-deformed’ art style, and it was also made to play with ‘bonuses’ on the Super Game Boy, a device that plugged into a SNES and allowed you to play Game Boy games on your tv, in color. 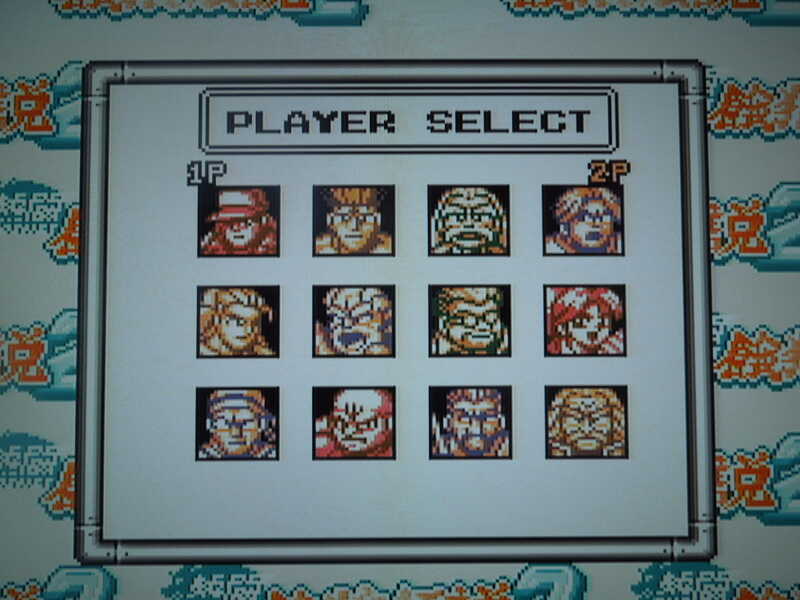 These ‘bonuses’ included a special Fatal Fury 2 game border, pre-set color palettes (although you can change the colors if you want), and the ability to play a 2 Player VS. match without having to have an extra Game Boy, game cartridge, or link cable – all that is needed is 2 SNES controllers. Story: After the game’s 3 protagonists, Terry Bogard, Andy Bogard, and Joe Higashi, defeated (and killed) the evil Geese Howard a year earlier in a Fighters’ Tournament, a new tournament is being held with some new fighters. Gameplay and Characters: Select your fighter among 12 characters: Andy, Terry, Joe, Mai, Kim, Jubei, Bear, Cheng, Billy, Axel, Laurence, and Krauser (Note: press Select, Select, Select on the ‘Takara’ intro screen to ‘unlock’ the latter 4 ‘boss’ fighters). Each fighter has his or her own unique fighting style and moves, as well as a distinct look and country of origin. For example, Joe is a Thai kickboxer, Axel is a boxer, Jubei is an old martial arts master, etc. After choosing your fighter, you will battle every other character in the game, including a mirror match vs your own character, in a ‘best of 3 rounds’ fight – beat them all, and you’ll beat the game. Press Select, Select, Select on the ‘Takara’ intro screen to unlock the 4 ‘boss’ fighters. Basic Control: Start pauses the game during play. Tapping A throws a weak kick; holding A throws a strong kick. Tapping B throws a weak punch; holding B throws a strong punch. Getting in close to your opponent and pressing B executes a throw. Pressing A+B when you’re a little way away from your opponent taunts him or her. Special Moves: There is a great FAQ online (just put ‘Fatal Fury Game Boy FAQ’ into a search engine) that describes each fighters’ special moves, but here are a few moves for Billy Kane so you get an idea of how they work: Rapid cane strike – Tap B repeatedly, Vertical Teleport Strike – Back, Down, Forward, A. Fatal Fury Flaming Cane (only available when your health bar is flashing): Down, Forward, Forward, Down, Back, Up, A + B. All of the moves are simple to pull off, and work well. Even without knowing all of a character’s moves, you can usually figure them out (except for maybe the more complicated ‘Fatal Fury’ moves) by inputting basic ‘fighting game’ motions on your SNES controller (or Game Boy if you’re playing the cartridge on the original handheld). Each fighter has his or her own desperation ‘Fatal Fury’ move when they’re almost defeated. Music and Sound: Pretty good. If you’re familiar with the Fatal Fury 2 theme, you’ll recognize it when you power on the game. Different stages have different themes, and most sound quite good for a Game Boy game. The sound effects are good as well, with punches and kicks sounding satisfying when landed on an opponent, and special moves have nice sounds as well. Slow game play: Fatal Fury 2 is a bit on the slow side. 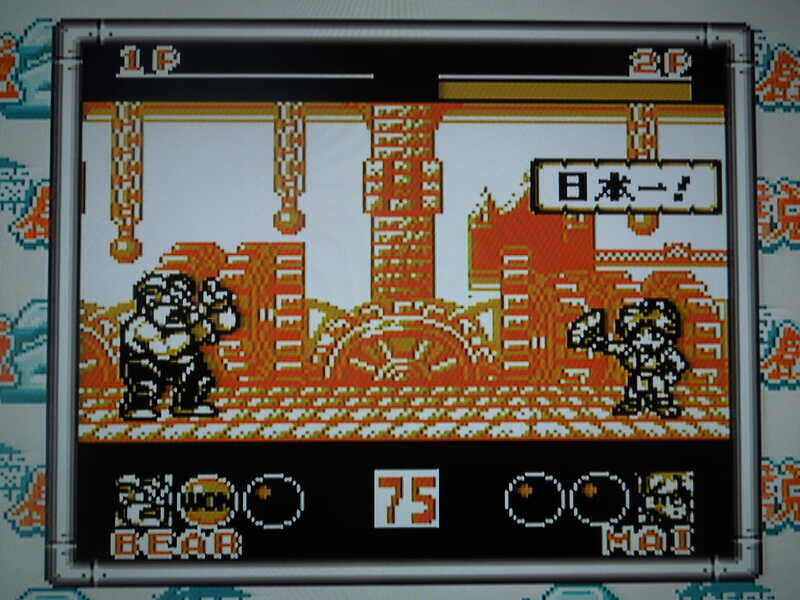 Now, some characters are quicker than others, and some (like Bear) are extremely slow, but even if you select a quick character, the gameplay can still be slow. Not terribly, pull-your-hair-out slow, mind you, just slower than say, the Neo Geo version. Did it bother me, personally? No, not at all, and that’s because it had no impact on the control of the game. 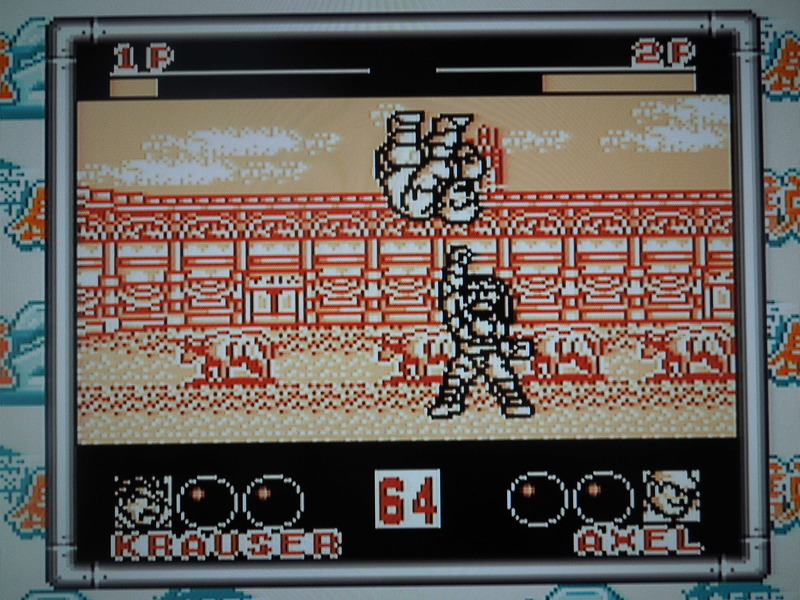 Each fighter has a unique fighting style. Options: When you start the game, you can set the difficulty from Easy, Normal, and Hard, and you can set the time limit on matches from 45, 60, and 90 seconds, or you can have no time limit. As far as difficulty, the game is simple enough to beat on Easy, but later fights become adequately challenging on Normal and Hard. 2 Player VS: When playing 2 player VS, you have the added bonus of getting to select which stage (12 total) you want to fight in, and the game actually keeps track of the win loss record of you and a friend, including which characters you were using. Note: Unlike in the Neo Geo versions, a 2nd player can not ‘interrupt’ the game to challenge player 1 – you’ll have to reset the game and select VS. Language Barrier: No and Yes. No, if you just want to enjoy a decent Game Boy fighting game. The main menu, including Story Mode, VS, and Options are all in English, which is great. The character names and win/lose bubbles are in English also. 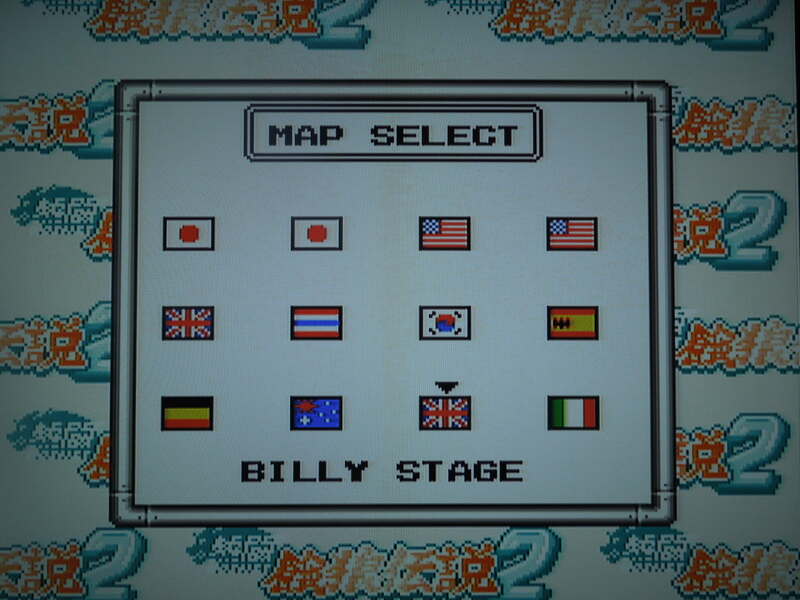 However, the ‘Story’ that plays during the game’s intro, the character ‘messages’ that are displayed during a fight or after a win or loss, and your character’s ending are in Japanese. 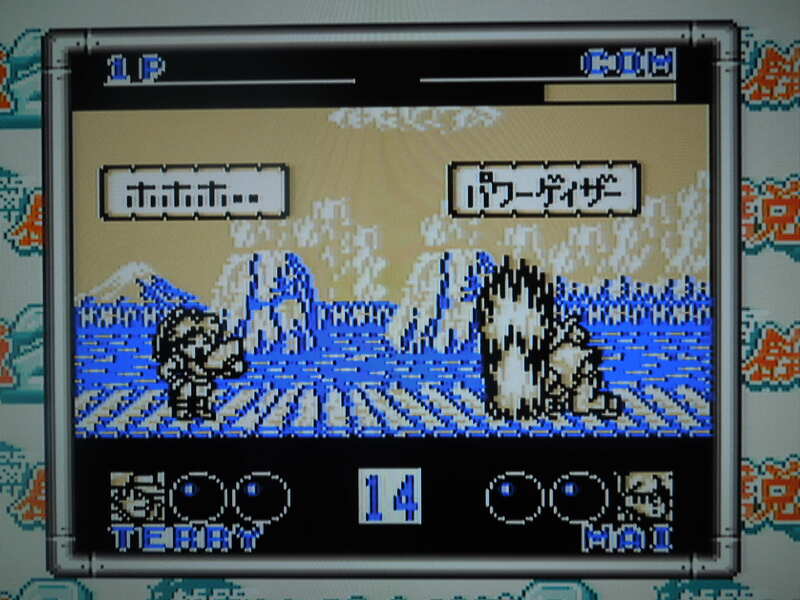 Actually check that – most character dialogue is in Japanese – Terry, for example yells ‘OK!’ after a win and Bear yells ‘Come on!’ during a fight (both in English), perhaps because both these characters are American. So, where can I find this game? It’s cheap on online sites like eBay, although you may have to order it from Japan. 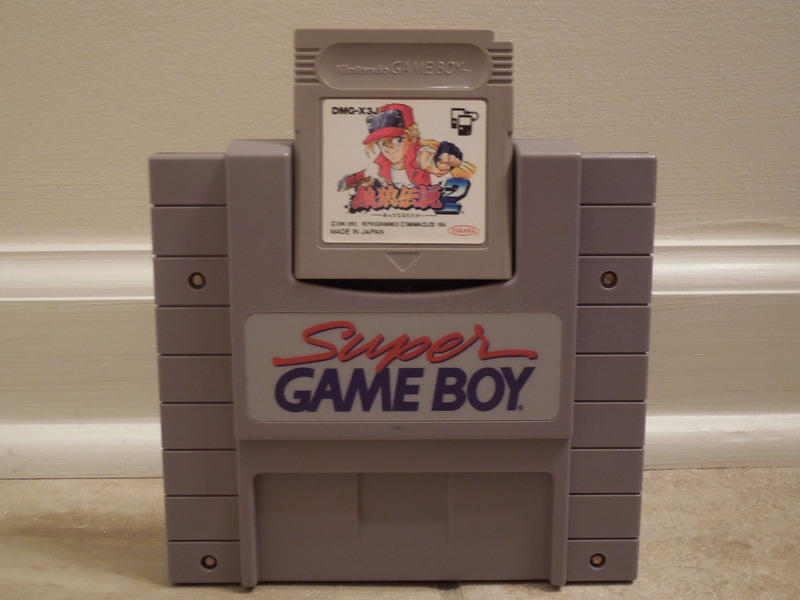 Remember, you can play the game on an original Game Boy, Game Boy Color, most versions of the Game Boy Advance, and the Super Game Boy on a SNES. You can also play the game on an emulator on your computer. Conclusion: So, why would I play this game on a Super Game Boy on my Super Nintendo when I could just buy the proper SNES version? There’s no great answer for that question, but I can tell you that Fatal Fury 2 for the Game Boy is not a bad game by any stretch. Sure, it’s slower than what most fighting game fans expect, but this doesn’t completely derail the game from being enjoyable. I really like the ‘super-deformed’ characters, and the challenge on Normal is close to perfect. Comparatively, is it better than Fatal Fury: First Contact for the Neo Geo Pocket Color? No, definitely not, but it’s still fun. Game Boy is far from a terrible game. This entry was posted in Game Boy - Fatal Fury 2 and tagged Fatal Fury 2 Game Boy Review. Bookmark the permalink.